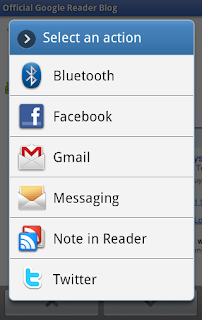 Today, we powered down Google Reader. We understand you may not agree with this decision, but we hope you'll come to love these alternatives as much as you loved Reader. 1. What will happen to my Google Reader data? 2. Will there be any way to retrieve my subscription data from Google in the future? Note -- all subscription data will be permanently, and irrevocably deleted. Google will not be able to recover any Google Reader subscription data for any user after July 15, 2013. 3. Why was Google Reader discontinued? A new look and feel that's cleaner, faster, and nicer to look at. 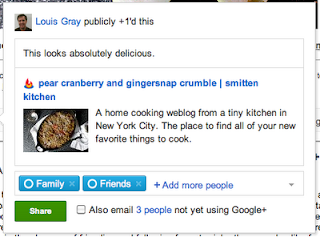 The ability to +1 a feed item (replacing "Like"), with an option to then share it with your circles on Google+ (replacing "Share" and "Share with Note"). Integrating with Google+ also helps us streamline Reader overall. So starting today we'll be turning off friending, following, shared items and comments in favor of similar Google+ functionality. We hope you'll like the new Reader (and Google+) as much as we do, but we understand that some of you may not. Retiring Reader's sharing features wasn't a decision that we made lightly, but in the end, it helps us focus on fewer areas, and build an even better experience across all of Google. If you decide to stay, then please do send us your feedback on today's set of improvements. Google+ is still in its early days, after all, and we're constantly working on improvements. If, however, you decide that the product is no longer for you, then please do take advantage of Reader's subscription export feature. Regardless where you go, we want to make sure you can take your data with you. 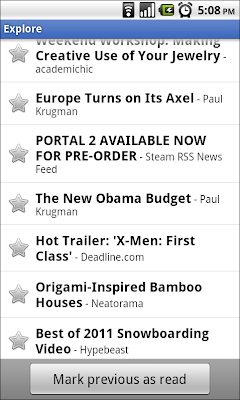 Updates to Google Reader on the web are rolling out gradually and should reach all users by end of day. 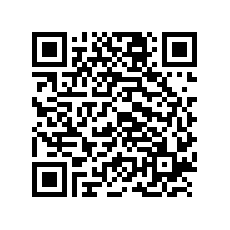 A new Android application will follow soon. If you have questions about today’s announcements, please check out our Help Center. 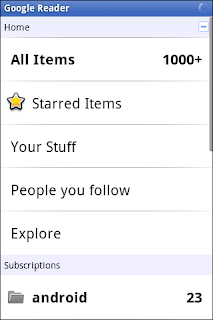 Unread count widget - choose any feed, label, person, or “all items” and get the unread count on your home screen. Clicking on the widget takes you to straight to that stream. News ticker widget - if you prefer a bit more information, you can add a larger size widget that cycles through items on any stream you want in Reader. Clicking any headline will take you to the article, while clicking the folder will take you to that stream. Mark previous as read - if you’ve used the mobile version of Reader before and missed this feature, it’s now back! As you scroll down your reading list, hit “Mark previous as read” at any time to only mark things above the screen as read. In addition to these new features, thanks to 20%-ers Alexey Retunski and Anton Vayvod’s support, we now have an official Russian translation as well. We hope you enjoy the updates - give it a try! You can download the app in all countries from the Android Market. The Google Reader app is available for devices running Android 1.6 or higher, with widget functionality available for devices on Android 2.2+. As some of you have noticed, we've recently enhanced Reader's commenting abilities, via an "Options" menu that is present for all conversations about shared items. You can now get a link to the equivalent conversation in Google Buzz, which is handy for passing around a funny thread. If it's your shared item, you can disable comments entirely, if for example the conversation was about a topic whose time has passed. Additionally, you can now moderate comments within Reader. If the conversation is on an item that you shared, you have the option to remove comments directly. 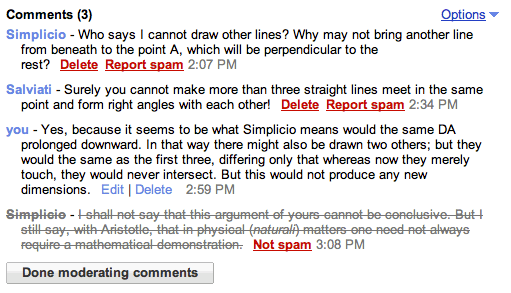 For all conversations, you can report comments as spam. We hope these changes will help you keep an elevated level of discourse about shared items. As always, if you have any questions or comments about these new features, please head over to our help forums, or send us a message on Twitter. 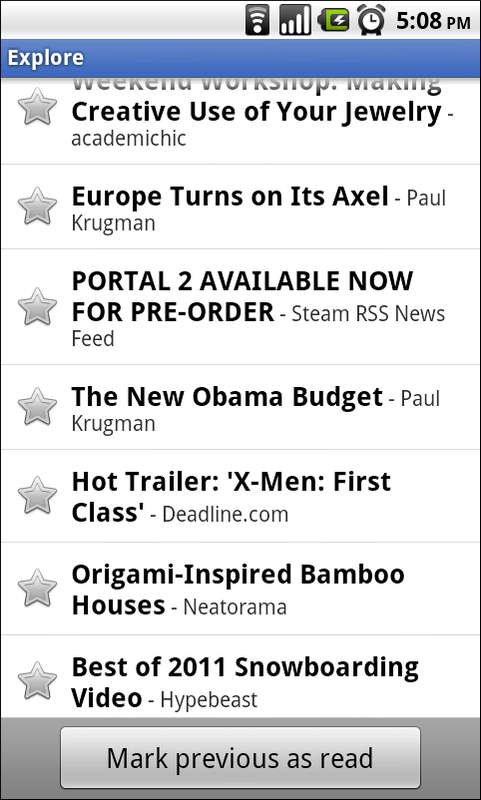 The Android Google Reader app is here! We’re really excited to make the first version of the app available today, and we hope you’ll try it out and let us know what you think on Twitter or our help forums. Update: Here's a link to the app on Android Market. It should run on Donut and higher.